My first edition copy, signed by the author herself. It is so sad to realise that there will never be any more books from Elizabeth Jolley. She died in 2007, but I still haven’t got used to it. It used to be that we only had to wait a year or so and there would be another delicious novel and that if we were lucky Jolley would make her way over from the west for an author talk or a literary festival – and even if we couldn’t go, we could enjoy the reports about how she came across as a demure old lady but then confounded expectations. 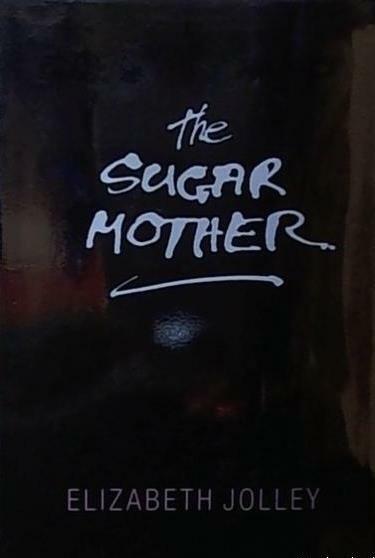 1988 was a bit of a difficult year for me, so I missed out on reading The Sugar Mother back then when it was new, but now that I’ve read it, there are no more new ones for me to discover. I still feel as if I have lost a favourite aunt. Edwin is an ageing academic, married to a younger woman. He’s a bit of a fusspot about things, deeply narcissistic and obsessive about the workings of his body, especially his digestive system. He records his trivial doings in three journals, one of which is devoted solely to diarising his digestion. The list of things he ‘can’t eat’ is long. He’s more than a little selfish. Work is a problem. Edwin is past it, it seems, and the faculty is not subtle about wanting him gone. He still thinks his lectures on the Renaissance are important but the Dawkins ‘reforms’ were around then, and university courses had to be ‘relevant’. The days of higher education as an intellectual pursuit not necessarily of immediate economic value are over. The days of tenure are over for most staff too, but Edwin can hang on until he decides to retire. So why then did Cecilia marry him? She’s a dynamic doctor, a gynaecologist who’s just abandoned him for a year-long sabbatical overseas. She has organised her friends to keep an eye on Edwin and we meet her large, clumsy friend Daphne early on in the novel, walking her big boisterous dog Prince in the pine forest near Edwin’s house. Daphne is single, and the implication is that it’s not by choice. Alas, Daphne has no idea how to make herself an attractive substitute for the absent Cecilia. Leila and her mother inveigle themselves into the house and into Edwin’s life in ways that invert the reader’s impression of Edwin in a rather startling way. Let’s just say that this is one of Jolley’s more delicious plots, and that Edwin – despite misgivings that he keeps suppressing – behaves in a way that is both charming and foolish. Self-delusion is one of Jolley’s favourite themes to explore. I loved this book. I loved the way it rejects the idea of the Australian suburbs as conformist, and I love the way it makes us wonder about the hidden lives of the people we meet. It is strange when the passing of an author leaves you, almost irrationally bereft. Back in the summer I read Without Reservations by Alice Steinbach. We had a few similarities and I quite fancied writing to her to say look at our coincidence. I really felt quite sad when I read of her death which happened in March 2012. As to Elizabeth Jolley I have not heard of her, but like the sound of this book, so added to my book list. An intriguing book by her Lisa, which in some ways seems gentler that many of her other books, but in other ways confronts the same issue of individuality versus conformity. I read this book around the time it came out but have often thought I’d like to read it again. I don’t think I would call myself an Elizabeth Jolley fan, Lisa, but I did love this novel (which I had the pleasure of proofreading for FACP). Mrs Bott stands out in my memory—a triumph among Jolley’s strange-ordinary characters; I’ve sometimes quoted her when teaching dialogue. It is indeed sad to lose a favourite author. I’m glad you had this one last ‘new’ Elizabeth experience to enjoy. Wow, proof-reading Elizabeth Jolley, that’s something to put on a CV! I agree, Mrs Bott is brilliant, just camp enough without being overdone.